Product prices and availability are accurate as of 2019-04-21 02:07:20 UTC and are subject to change. Any price and availability information displayed on http://www.amazon.com/ at the time of purchase will apply to the purchase of this product. 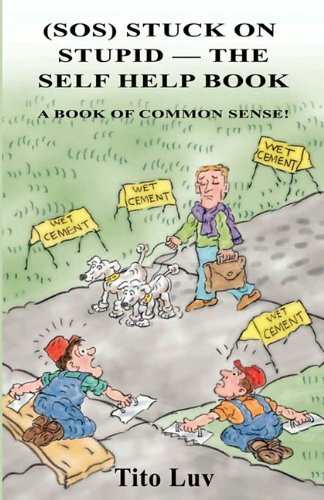 (SOS) Stuck On Stupid -- The Self Help Book: A Book of Common Sense! is another great book by the frequently outrageous, but always entertaining, Tito Luv. "(SOS) Stuck on Stupid -- The Self Help Book" is a humorous piece of literary effort communicating stories on serious subject matters in a most distinguished way. You may find yourself embarrassingly laughing out loud while describing current events you otherwise dare not discuss or speak about in public with family members, close friends or business associates. Regardless of age, readers from all generations will get a kick out of Titoism Humor and may even learn a thing or two if they're not careful, in the event one's prepared to propel a mind into ultimate learning mode. This hilarious but cognitive material spares no one's feelings, although some shall continue finding humor even after they've become angry or thoroughly disagree with certain subject matter. Information offered from cover to cover provides inquiring literary fans answers missing from lingering questions, which seem to have been hanging around forever. "(SOS) Stuck on Stupid -- The Self Help Book" is the quintessential book-taught-piece for this Twenty-First Century Era.